Bless up. Bless up because “Jack Huncho” which is the debut album released by by the hip-hop group Huncho Jack which consists of Travis Scott and Quavo has been released. The album has 13 songs that include popular songs like Modern Slavery, Black & Chinese, and Huncho Jack. This album has been something many have been waiting for since a collaboration album between those two artists have been spreading across social media. Quavo isn’t new to collabing with other artists outside his main group Migos which is something I really like about him. Something else I really like is the creative painting they use as their album cover. Reactions on this album are being uploaded to Youtube almost every hour across the world. Collaboration albums have always been done but that doesn’t mean they’ve always been done nicely. Hip hop lovers like me are used to seeing maybe one song between their favorite artists but hearing a whole album got released is more than a blessing. My favorite song is Eye for an Eye featuring Takeoff which is apart of Migos. My other favorite song has to be the first one on the tracklist, Modern Slavery, which features a rich, soulful Otis Redding “Cigarettes and Coffee” sample. The energy both of these artists bring with every track is enjoyed every bit. Adlibs are thrown nicely and the beats are similar to what Quavo and Travis Scott bring to the table individually but isn’t much a surprise considering the producers they have. Teasers of their songs were posted by them and had me begging for a release date. But they didn’t do us like Drake been doing his fans lately, posting snippets of songs that he won’t release any time soon. 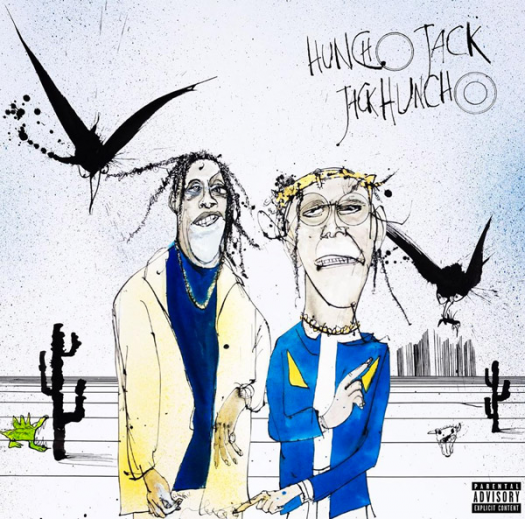 Jack Huncho can be streamed on Tidal, Apple Music, or Spotify. Make sure to listen to it before people on Snapchat abuse it.